If you’ve been contemplating buying an electric hot comb let me help you make your decision! These are really cool new hair appliances which comb through hair, straightening it as they glide along each section. Even if you’re used to using hot brushes or hair straighteners you should try one of these. I’ve never used a comb in my life except for when I go to the hairdresser and my hair is combed out before blow-drying. I always thought a comb was too fine to get through my thick hair but I was wrong. Actually, combing my hair with one of these gets right through to the root and using one of these electric hot combs has re-invented hair straightening for me. I feel that these new electric hot combs are much kinder to my hair than traditional straighteners or the hot hairbrushes available. What is an Electric Hot Comb? How is an Electric Hot Comb Different to a Straightening Brush? Will it Work On Your Hair Type? 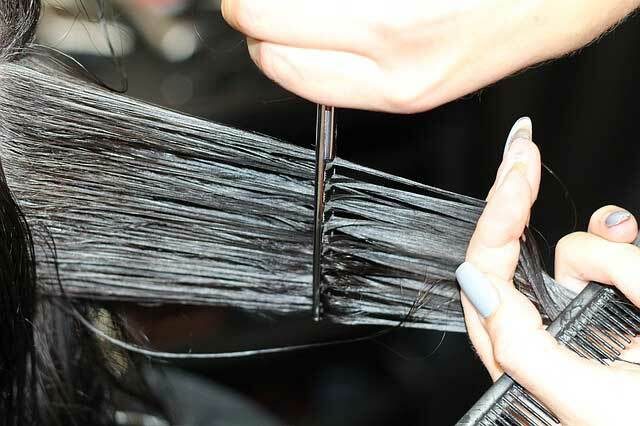 Hot combs are designed to straighten out hair but they’re different to hair straighteners and hot hair brushes. They have wider teeth, so they glide through hair effortlessly without snagging or pulling. This reduces the chance of breakage and helps to eliminate tangles. They look like large combs, except they have a power cord that attaches to an outlet. The function switches are usually located on the handle (on/off, temperature/display). Even if you’re used to using hot hair brushes or you favor your hair straighteners, you should definitely try one of these. You’ll find them gentler on your hair and easier to use. Even if you’ve got very thick, unmanageable hair, don’t dismiss the hot electric comb because it’s fine to use on any hair type. That means fine hair, medium-thickness hair, thick hair and long hair. One of the biggest benefits to using a hot hair comb is that the teeth are thinner than brushes so they really get to the edge of the root. It’s essential that the root is smooth if you want the rest of your hair to stay straight and sleek – that’s what the electric hot combs do, they get right to the root of the matter! We would go as far as to say that electric hot combs have re-invented hair straightening and they’re definitely kinder to hair. 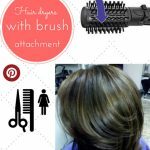 The only differences are the appearance – a straightening brush is more brush like, with multiple bristles whereas hot combs don’t have bristles, they have teeth and they are set further apart than the hot straightening brushes. Essentially, they operate in the same way. Any hot tool used inappropriately will damage your hair, that includes the hot comb but, they are better for your hair than straighteners and brushes as there aren’t as many bristles radiating heat and they don’t “clamp” down on hair like straighteners. Always use the correct heat setting for your hair type (low for fine or damaged hair, higher for thicker, healthier hair) and never go over and over the same area of hair as this dehydrates it. Never use the hot combs on wet hair, they are only for use on dry hair and always apply a heat protecting spray before use to act as a barrier between high temperatures and your hair. Yes, an electric hot comb is designed for any hair type, even very thick, hair. Only use on dry hair. Always apply a heat protecting barrier spray. Only use the right temperature for your hair type. Don’t repeat areas more than once or twice. Limit using your hot comb to twice a week. Always give your hair a deep conditioning treatment when washing to rehydrate it. 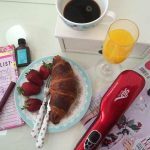 Here are our top electric hot combs and why we love them! This is designed for thick and course hair. Yes I know it’s a comb but it really gets through thick hair because the teeth aren’t too close together! This comb heats up to 400 ° F in just 30 seconds and has a huge amount of heat settings. There are actually 20 to choose from! I used a high heat setting and found it was too hot so I went down a couple of notches and it still glided right through my course hair a treat. This comb is good for all hair types because of the different settings. What I like the most is it works on re-growth. I’ve had my hair relaxed but it still has a kink to it at the roots and all the way through after I wash it, this comb grabs that kink and smooths it right out. Other bonuses include the auto-shut off feature which is good for forgetful people (like me!) it’s also really good looking, in a gorgeous gold color and the cord swivels so there’s no getting twisted up when using it. One negative, the switches are in an awkward place so sometimes I switch it off during use by mistake. From the people who brought us hot brushes comes the AsaVea Straightening Comb with anti-scald patented technology so you won’t burn your scalp! 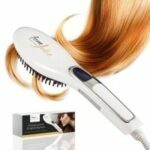 It promises instant heat upon contact with hair and takes just 60 seconds to reach temperature. It also maintains constant temperature meaning no hot-spots and good heat conduction. The AsaVea heats up to 365 Deg F (you shouldn’t need a temperature any higher) and it’s small but powerful for good looking, straight and sleek hair from the root. There’s also a useful LED display so you can keep an eye on the temperature setting and a 30 minute auto-shut off, so there’s no chance of accidents or overheating. This is a great electric comb, from trusted hair tool manufacturers. The Laila-Ali Plated Heated Styling Comb represents a quality option with a similar feature set as the top options. Expect fast heat-up (30 seconds) and instant heat recovery so the product stays hot during styling. The swivel cord is long as gives you ease of styling and there’s even a safety stand so your surfaces stay nice and protected. This product heats right up to 450 Deg F, although you shouldn’t need such a high heat setting. The teeth are 24 carat gold plated and conduct heat very well, which means no hot spots and better protection for your hair. It’s a good, all-over straightening tool that will leave your hair nice and shiny looking with straight roots too! Now for something a little bit different! This is a more economical option and represents an older style. This hot comb relies on the old-fashioned way of heating up styling tools. You hold it carefully above the stove over heat for a few minutes and then wait 30 seconds for it to cool a little, never use it when it’s red hot. Then, style your hair from the root. You must take great care when using so it’s not ideal but sometimes, the old-fashioned ways are still the best. It does manage to straighten out hair and it’s a good inexpensive comb if you’re on a budget but is it as good as the modern electric combs? No. I would say it is a good hot comb and heats up to 450 °F (a little higher than the Andis). I didn’t need the top setting. In one respect it’s better than the Andis because it’s more comfortable to hold, it has a special soft-grip handle which gives you no wrist ache. The comb comes with a safety stand as well so there’s no danger of burning any surfaces and it has a long cord which doesn’t get tangled up. This is a good size to travel with too and it’s less bulky than a hot brush or set of straighteners. Again, I was doubtful it would work on my course hair but it does because of the wide teeth and easy controls. I also feel that it doesn’t “burn” my hair like brushes or straighteners and it’s brilliant for taming frizzy roots. Don’t forget to wash and dry hair first before using any hot combs; they are not designed for wet hair use.